More than 850 beauty industry executives and salon professionals attended the City of Hope’s National Professional Salon Industry 2014 Spirit of Life gala in Las Vegas on July 12, and more than $850,000 has been raised so far in honor of 2014 Spirit of Life Honoree Harlan Kirschner, president of The Kirschner Group, Inc. Now, everyone can help “Celebrate Cures” by experiencing the event’s first-ever digital edition of the campaign journal! The City of Hope digital journal includes photos from the gala event, special updates from City of Hope, a feature on Kirschner and his family, and results of MODERN SALON’s Healthy Hairdresser research project, held in cooperation with City of Hope, which focuses on helping to indentify salon professionals’ health problems and concerns. 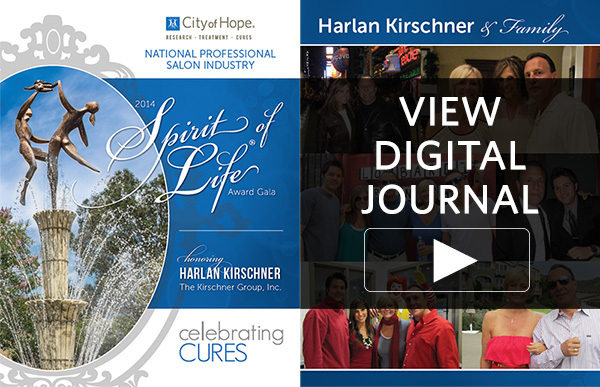 To view the City of Hope Spirit of Life digital journal, click here, or visit cityofhope.org/salon/sol. City of Hope thanks and acknowledges the generous support of Spirit of Life 2014 sponsors and donors, including American International Beauty, ColorProof Evolved Color Care, Revitalash, Redken, The Kirschner Group, Jinny Beauty, MODERN SALON Media, Graham Family Foundation, Helen of Troy, JCPenney Salons, Joico/Zotos, KAO USA, Matrix, Paul Mitchell Systems, Professional Beauty Association, Creative Age, Revlon Professional Brands, SalonCentric and Wella. Companies or salons interested in getting more involved with the National Professional Salon Industry efforts to support City of Hope or who wish to host their own fundraiser should visit www.cityofhope.org/salon and click “Get Involved” or contact Kathleen P. Talbot, Director of Philanthropy, at (800) 272-2310 or [email protected]org.